To remember the “Shok Generation”, the Bengali Months name came from “Shok Calendar”. Some name also came from Stars. The name Agrohayon has another explanation. Agro means Prothom (First) and Hayon means borsho or dhan (year or paddy). At that time this month was the first month of the year or the harvest was brought to the house in this month. This is why this name was given. 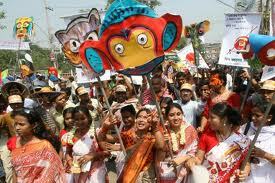 Today is the 14th of April, 2011 and first day of Bengali New Year of 1418. 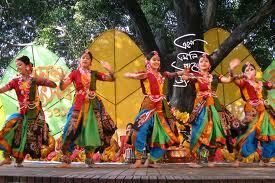 Before I go back to the history of the Bengali Calendar I am wishing everybody “Shuvo Noboborsho” "শুভ নববর্ষ" . As like other years, this year's first day of Bengali Calendar was also celebrated across the whole country traditionally. Mughal Emperor Akbar was remembered for many significant works in Bangla. His father Emperor Humayun was died early and suddenly the power of ruling a kingdom came to Akbar’s hand in 1556 while he was only 14 years of old. Bangla was an important kingdom for Mughal Empire. As soon as Akbar sat as an emperor, Agra and Delhi went to Himu’s conquered. Then Himu targeted Akbar and attacked him. Akbar with Bairam Khan, defeated Himu in Panipat Battle in 1556. To collect tax from farmers easily He introduced the “Elahi Shon”. At Mughal Empire, kings collected tax according to the Hijri Year (Arabic Calendar). According to Hijri Calendar, one year is equal to around 354 days. So approximately it is 11 days shorter than English calendar. It created confusion among the farmers as they could bring their crops after a certain time. As a result the farmers had to struggle to pay their tax in time. So Akbar had to bring changes in calendar and he gave the responsibility over Amir Fateh ali Shirazi to do that. With his afford, a new calendar was established in 10th or 11th March, 1584. This new calendar was named as “Elahi Shon”, which was familiar as “Foshli Shon” to the farmers. Next it became “Bengali Year” by changing. This calendar was introduced first in Akbar 29th years of conquered, but the counting of this calendar began from 1556 as he defeated Himu in a historical battle in 1556. Australia has reached in Bangladesh to play a 3 match ODI tournament in Dhaka. The tournament is about to start from 9th of April, 2011. The other two matches will be played respectively at 11th and 13th of April. All matches will be help in National Stadium, Mirpur, Dhaka. The tickets for 1st ODI were distributed yesterday 7th of April. The people of Bangladesh have already experienced the heck of collecting tickets. Yet again, it seems tickets crisis for Australia-Bangladesh ODI series as well. GrameenPhone is organizing the distribution of tickets for Australia-Bangladesh ODI Series. You can buy tickets from GrameenPhone center. The capacity of Mirpur stadium is 26 Thousands, but approximately 19 thousands tickets will be available for people and 6 thousands are courtesy tickets. Among these 19 thousands 40-50% tickets will be sold from National Swimming Complex near the Stadium at the Match Day. Bangladesh conducts its fifth census 15-19 March 2011. Population census is a nationally important program as it collects basic information on all education, health, household and profession. President Mohammad Zillur Rahman has been enrolled by a population census worker at Bangabhaban in the capital on the first day pf the fifth population and housing census 2011. 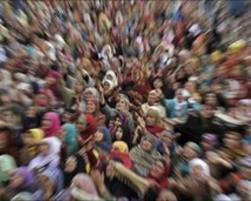 Fifth population and housing census started on March 15 and completed by 19 Match 2011. Some 310,000 census takes and 57,000 supervisors were appointed to conduct the five day census that began on 15 Match 2011. The country was divided into 130 census districts where a census coordinator supervised the activities of each of the census districts. The census data are beckoning on 15, 16, 17, 18 and 19 Match. During these days the enumerators moved from house to house and counted household population where they live. Everyone can help enumerators when they visit every household. By opening your door you can provide the information they asked and be cooperative. It is important that we give the enumerators full cooperation for the success f the census. We will serve our country if we provide information for the population and housing census 2011 accurately. Last but not the least the census is only a complete snapshot in time. It is hoped that the policymakers, planners, social scientists, statisticians make the best use o the census dater for formulating, measuring the policies and plans, evaluating the population dynamics, impact of development goal and vision in future.